The web was full of glowing reviews of this system. Now I figure they were all using older firmware versions at the time they posted their reviews. The problems seem to have started for people in the summer of 2017. Many nights after work were wasted tweaking the settings, moving the Orbi router and satellites to different places in the home, scouring reddit and the Netgear forums, trying various firmware versions… and not really getting anywhere. So many people were having the same problems as me that I figured my device was not defective, and that something else was to blame. Netgear has been working on solving these problems for the better part of a year but has yet to put out a new stable firmware. We’re having to take things into our own hands here. The only router firmware version that gave reasonable stability (but still a little flakey) was 1.11.0.20. But that one was feature-poor, missing security patches, and also lacked ethernet backhaul. I wanted to use 2.1.2.18! Was it the Google mDNS Flooding Bug? There was a known-problem with Google devices waking from sleep and flooding the network, and I’m sure that was just making things worse, but my problems persisted after Google patched those bugs. I have an above-average sized home, but the Orbi RBK50 system is rated for a 5000-square foot home. It’s a router + satellite access point bundle. I think it was just overkill here. My house isn’t big enough for Orbi! My previous AC router could not reach one end of my home and there were dead spots in two rooms. But the Orbi just blasts through it all like it was nothing. And that was actually a bad thing when there’s two powerful access points competing for the airwaves. However, the Orbi router by itself wasn’t quite enough for full speeds so I still needed the satellite, too. In all my years of WiFi usage, I’ve only ever had stable performance on channel 6 or 1, and nothing else. Orbi’s “auto” setting would choose other channels and my 2.4Ghz devices hate that. Note that if you change this in the Web UI, it will overwrite any of your changed settings in the next step for SSIDs. So do this one first! The Orbi uses the same SSID for its 2.4 and 5ghz bands. My devices were switching between 2.4 and 5ghz all the time, when it seemed entirely inappropriate for them to be doing so. Separating the SSIDs was critical. I have no idea why they don’t allow you to change this through the Web UI. You CAN do this however, by visiting the debug.htm page on the router and enabling telnet, then running some commands. Note that you must do this on both the router AND the satellite. There is a post with instructions on the Netgear forum. My stationary devices were also randomly connecting to the access point that was furthest away from them. Argh! I set the 5ghz to 75% power and the 2.4ghz to 50%. My devices no longer connect to the wrong access points. This is probably networking 101 stuff but I didn’t try this until much later than I’d care to admit. I don’t know if this actually matters, but it seemed weird to me to have a critical part of my network infrastructure with a dynamic IP. I gave static IPs to as many things as possible, in addition to the satellite. I’m guessing that devices endlessly reconnecting and getting new dynamic IPs could lead to IP conflicts. Correct me if I’m wrong. Orbi’s DHCP log was a mess and it sure seemed to like to give out 192.168.1.100 to different devices. Update: I set up a Pi-Hole server on a Raspberry Pi which handles network-wide ad blocking as well as DHCP duties. Orbi’s DHCP server left much to be desired and the UI is painful to use when assigning static IPs. And it has lost all of my settings more than once so far, which is frustrating to say the least. Pi-Hole, on the other hand, has been amazing! Finally, after months of frustration, my Orbi system is stable. And I can even use the ethernet backhaul again. It’s become the set-and-forget system that I wanted it to be from the start. Good luck with your Orbis, don’t lose hope. During my struggles, I learned that Orbi probably was not the right solution for me after all. Orbi’s biggest advantage is its superb dedicated wireless backhaul, which is a feature I don’t need since I am able to run an ethernet cable to the satellite. I didn’t need a “mesh network,” I needed multiple access points for the same WLAN. And more control over the configuration and features of the router would have been very welcome. I should have purchased a set of Ubiquiti Unifi APs instead. Now I know for next time. This entry was posted in Random and tagged networking, orbi, troubleshooting. Bookmark the permalink. How and where do you change the transmit power? I am glad this helped you. Thanks for responding. My Orbi is still solid now with the changes above, all these months later… unless there is a power outage. Then the wired backhaul completely takes down the network and I have to wait 5-10 minutes and plug it back in. I ended up buying an extra UPS just for the satellite. Hello Jon, Greetings for metro Detroit. I have been experiencing the same drop issues with my RBR50 and 2 – RBS50 for several months since my orbi was purchased. The issue is daily disconnects that lasted 3 -5 minutes. I found a created around that work and crippled my coverage by disconnecting one of the satellites. My coverage was impacted and there were dead spots throughout the house and no drops. I returned to the Internet and came across your suggestions. The changes have been made to separate 2.4 from 5GHZ traffic by SSID and after several hours I have not had any drops. I am hopeful your suggestions will solve my issue and wanted to thank you for posting it. Orbi is junk and Best Buy should know this as that is where I bought it, based on their recommendations. Their Geek squad set it up in my house and there were drop problems from the start. They have been back and their only solution is to move the satellites around the house in different rooms and it is not working, still dropping. Hi Jon! Chanced on your write-up when i googled for a solution to my devices connecting to 2.4G when a strong 5G was close at hand. I live in a 2,000 sq ft apartment and moved from an Asus AC5300 monster to the Orbi to get over a couple of dead spots and after frustrations with extenders. I’ll try some of your suggestions but your writing style certainly made my home networking day!!! I’ve implemented solutions 2 and 3 yesterday (hoping solution 1 won’t be necessary). My kids were ready to murder me (“you promised faster WiFi and all we get are outages”). I sure hope this fixes the problem. Sad to say, the WiFi outages continued. So I also created different SSIDs for the 2.4 and 5 GHz bands, but I still had a short WiFi outage the next day. Running the latest firmware (V2.2.1.210), RBR50 with 2 satellites. Did you do the SSID separation steps on the satellite as well? The first time I did it I forgot that part. These channel updates may have required re-doing the SSID separation by Telnet again due to the Web UI on this page (has only one field for the SSID). But it’s been a while, not sure on that. Thanks for all your advice! Really kind of you, helping me out. No, I don’t think I separated the SSID’s on the satellites. I will try that this weekend. I will also set the channel from “auto” to a set channel, does it matter if it’s 6? – Daisy-chain topology: for now both satellites can reach my base station so I will disable it. At least until the summer when I will want to put one satellite in the garage to cover my garden. – Disabling mu-mimo and fast roaming: I hope this won’t be necessary. It seems to me that with a mesh system fast roaming is really handy (walking around in the house). Same for mu-mimo (with multiple devices online). I understand how fast roaming could get you in trouble if there is a lot of overlap between router and satellite. Have you got a theory on why mu-mimo might cause trouble? For 2.4GHz, I’ve only ever had reliable performance on channel 1 and channel 6. When I let my router choose an automatic channel, it sometimes picks something in between, and my devices seem to hate that. I only turned off mu-mimo because at the time that I got my Orbi, their firmware was atrocious and some features weren’t working properly. Since my system is stable, I haven’t messed with it much. I may try turning it back on one of these days. I’m pretty close to taking my Orbi back to Costco. It’s pretty unbelievable how poor it is and how it seemingly can’t handle common client issues (like a laptop connected via WiFi and Ethernet at the same time). 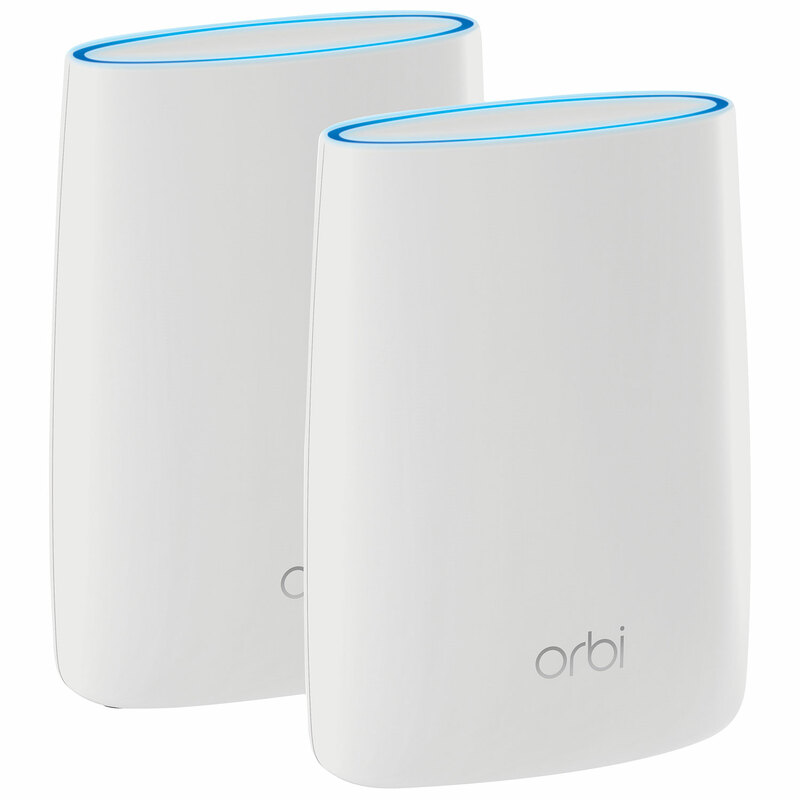 Might try using my own router and the Orbi as just an AP, but not sure if that’s worth the cost not to use those features. I purchased it to replace my Amplifi system, which is also very disappointing considering how good Ubiquiti’s pro products are. If I had the Costco option, I probably would have returned it back when I was struggling. I considered the same option of using it as an access point only, but never got around to it. It eventually became stable for me. One thing I did change which I’m happy with was setting up a Pi-Hole server on an old Raspberry Pi, which now handles my DHCP assignments instead of the Orbi. I was very unhappy with Orbi’s DHCP server and Web UI, but the Pi has been rock solid in that regard. I believe that my Orbi problem is slightly different. I have great connection to my Orbi’s everywhere in my house. What I DON’T have is reliable connection to the internet. I have had my internet disconnect in the middle of client calls (I work from home) and while waiting for calls (VOIP) with no notice. I believe it is the Orbi, because I can plug my laptop into the ethernet coming into the house and it works just fine. Anybody else having issues, not with the connection to the Orbi, but the Orbi keeping the internet connection? Lastly, like many others, I cannot believe I bought this expensive piece of junk system, and definitely cannot believe that Netgear can’t figure out a firmware fix. In my spare time, I leave negative Orbi comments on Twitter. I was having similar issues and tried some of the solutions above, but the cause of my problem was different. I use ooma for home phone, and somehow the ethernet cable was plugged in to the wrong ethernet port of the ooma, which apparently caused significant problems, but only with wireless connections with many devices not working at all, in particular several google homes. My wired connections continued to work. Once I plugged the ooma into the right port on the problems seem to have been fixed. I have an RBR20 Router with one RBS20 Satellite (about 30 ft away from Router) set up in a 1.3k sq ft apartment with a fair number of 2.4G and 5G wifi activity from neighbors. Since purchasing the Orbi, I’ve noticed random wifi connectivity loss due to Router reboot (about once a week), Satellite reboot (likely corresponding to Router reboot, about once a week), two of my 2.4G legacy devices dropping connectivity at least 2 times per day, and two other 2.4G legacy devices dropping connectivity about once a week. I’ve followed all other suggestions in the post and will evaluate ongoing. Note that when I made all suggested changes, my Satellite in showing a Poor Backhaul Status but I’ll evaluate connectivity / reboots over the next week to see how it performs. Late response but I still have separate SSIDs working, and have rebooted/upgraded firmware plenty of times. I haven’t had to downgrade the firmware since late 2017, and just always use the latest version now. Regarding your 2.4Ghz devices: I’d recommend forcing the channel to 1 or 6 if you haven’t already tried that. I moved from a great Asus AC5300 monster to the Orbi RBK50. Two satellites (RBS50 and RBW30) connecting wirelessly, both with fixed IP addresses assigned. Had some trouble with devices holding on to a weak 2.4 GHz signal, which this thread helped me fix by reducing the transmit power. After six weeks of otherwise perfect performance, I started experiencing the random internet connectivity dropouts that seems to affect several users. The issue would go away after an Orbi reboot, only to recur randomly the same day or after a few days. I have ~20 devices connected, with 8 of them being Sonos speakers connecting via a Sonos Boost wired to the router. Spent several hours of reading various threads including re-reading this one. Assigned fixed IP addresses to all the Sonos devices. But what may have really helped is a change to the Orbi’s 2.4 GHz channel from Auto to 6. The Sonos is set to channel 1 via the Sonos app. I haven’t had any dropouts for a week. Will be useful if someone with a similar issue can validate this. I, too, had many issues with the 2.4Ghz devices until I set Orbi to use channel 6 permanently. Been meaning to update this post to include that. Basically, you go to the http://IP-HERE/debug.htm URL on the Satellite, too. Substitute in the IP of the satellite. Then you connect by telnet and execute the same commands that you did on the router, and reboot it. But that didn’t seem to help. I’m on firmware V2.3.1.44. All was good and my satellite was working good until I updated to that a few days ago. Now my satellite keeps saying “config sync” and nothing connects to it any more. Occasionally something will, but then it goes back to the main soon after. The only reason I’m even trying to split the SSID’s is because on of my fire tv box would randomly disconnect and it would take awhile to get it connected back. I don’t have a problem at all with my fire 4k stick or any other devices. Another note…I didn’t change my 5Ghz SSID, but just my 2.4Ghz. Could it be helpful to change the 5Ghz also? I can confirm that I only changed those two settings 10 days ago, no issues since then!